King Family Legacy Library opens today at the The Millennium Gate Museum. Today's dedication will have a unique opportunity for members of the King Family to share from their private collection of books, music, art with visitors of the Museum. We felt this was an oportunity to share our gifts and blessings bestowed upon our family with the rest of the world. Our prayer is that it inspires others to seek and experience the benefits of their own gifts" stated Alveda King. Alveda King Ministries announces the dedication of the King Family Legacy Library. 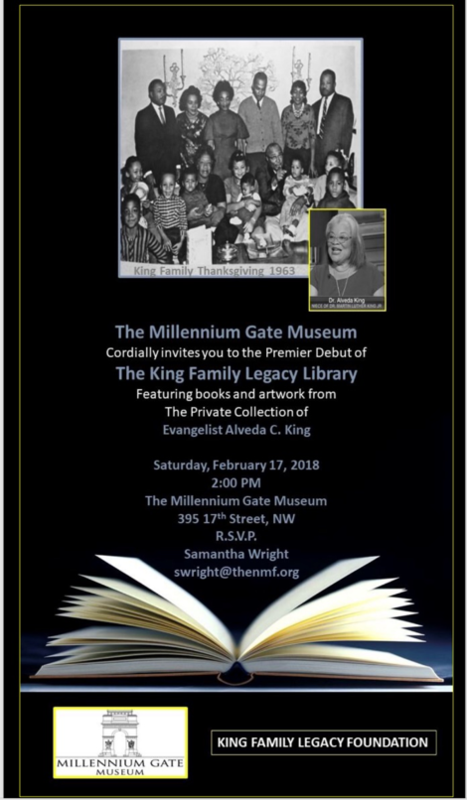 This special space within the Millennium Gate Museum will feature books, art, music and more from the private collections of mother and daughter, Ms. Naomi and Alveda King. The ceremony will be held at 2:00 p.m. on Saturday, February 17, 2018 at the museum located on 395 17th Street, NW, Atlanta, Georgia. This event is free and open to the public. "My mother and I are supporters of arts,the preservation of history, and the advancement of science. Often we discover that throughout history some of our greatest "minds" have never been limited to one scope of creativity. I call them gifts. These gifts are not confined to genre, skin color, class, nature, age or gender. They are divine blessings to humanity. We felt this was an oportunity to share our gifts and blessings bestowed upon our family with the rest of the world. Our prayer is that it inspires others to seek and experience the benefits of their own gifts" stated Alveda King. This inagural event will include greetings and acknowledgement from special guests like Rodney Cook, Founder of the National Monument Foundation and The Millennium Gate Museum, Kathy Fincher, Award Winning Artist, Angela Stanton, Author, Publisher, Reality Show Personality and a special vocal performance from Ms. Paulette Smith, Award Winning Vocalist. The ceremony culminates with the partiicpation of Ms. Naomi King and Alveda King. Alveda King is a "Creative Christian evangelist" and civil rights activist. She known for her creative contributions in film, music, politics, education and journalism. King is a presidential appointee, actress, singer, songwriter, blogger, author. For more information about evangelist Alveda King, please log onto http://www.alvedaking.com.